This week’s really one for anyone who likes big red wines. Syrah, or Shiraz as it’s called in most other countries, is famous for being just that. Up and down the Rhône valley it produces blockbusting wines. Reason I pick out those three is that it gives a good range of wines from that area. The Côte-Rôtie (roasted slope) is where you can get hold of very fat wines, full of fruit and a bit of flower, and quite a lot of the time the smell of bacon. Yep I said it, bacon! 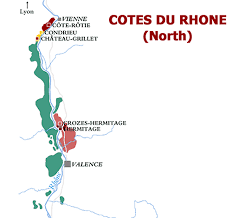 Wines from the Côte-Rôtie are top drawer, but usually have a price tag to follow. Hermitage is pretty much just one hill filled with vineyards. Because of the soil and the way the sun and wind and all that hits this hill during the days, this is another prized area. The soil’s different, and you get more minerally wines than the Côte-Rôtie. Again wines from prized areas don’t come cheap! The cheap(er) way of starting off with Northern Rhône Syrah is Crozes-Hermitage. It’s basically the valley floor next to Hermitage. Everything’s similar, except the slopes. And the ownership. Most of the wines down here are made by co-ops. They buy the grapes from lots of growers and make the wines themselves, and bottle for different companies, such as supermarkets (and stick the supermarket labels on them). It is a cheaper product, but it’s still going to give you everything you want for a starter for ten with Northern Rhône Syrah. I love wine from this area and look forward to your posts reviewing them.